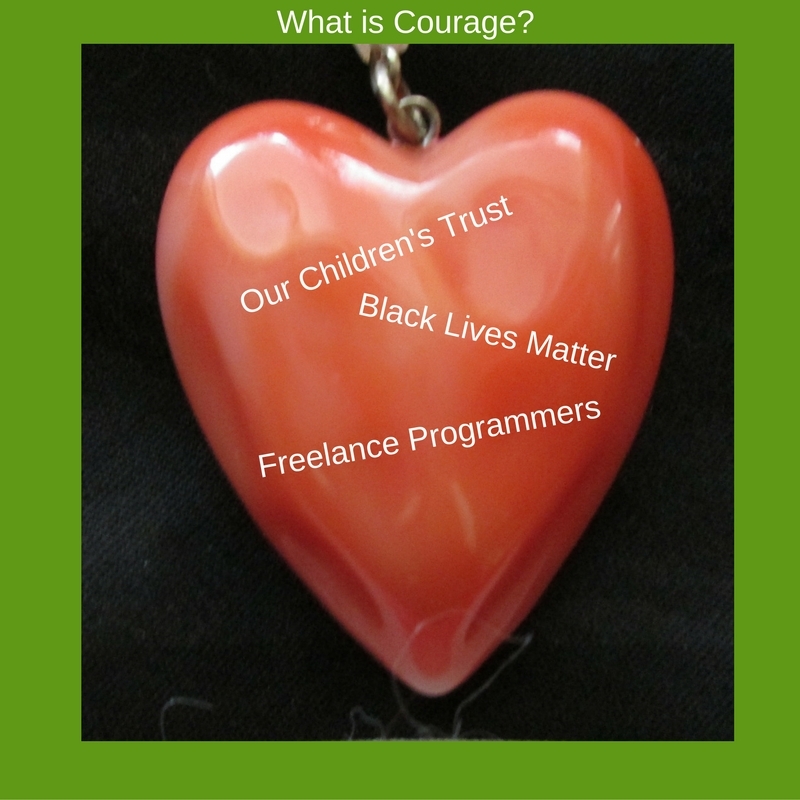 Courage as a root word come from the Latin root “cor” which means heart. It evolved to mean bravery. I think its original root tells the true source and nature of courage in humanity. I believe it takes heart or caring to act courageously. I have three examples of what I would call courageous behavior. These are examples of people who have taken bold steps in their lives and made some big and invaluable changes to our past, present, and even for my, our, and their own futures. One is from the past and goes into the present. The person I would call courageous is Dame Stephanie Shirley also known as Steve Shirley who founded Freelance Programers in 1962, an all woman computer company. Her story is well told in a TED talk and, particularly, from TED talks on NPR.org. These children and young adults appeared in court again in Eugene, OR along with their lawyers to continue the fight on September 7. No decision has been reached, yet. The fact that they are from all over the USA and are fighting for all American children and children world wide is very inspiring and courageous to me. They are legally fighting oil companies, and some of the biggest industries in this country. In my previous blog, I spoke about the youngest person, Levi Draheim, who is a plaintiff and who you can see in the corner of the photo in this story about Our Children’s Trust from that September 7, 2016. These young people are influencing other youths to step up and courageously join this law suit. From Maine, here is another story. The final group where I have witnessed great courage, is Black Lives Matter movement. The first protests took great courage. Our “justice” system is broken for people of color. This truth has been hidden all over the USA for years. Exposing the lack of justice, particularly for African Americans, has taken great courage. Incarceration in the USA was becoming another “business”, that was destroying the lives of so many Americans of color. Our police forces have become more militarized. Not to mention the great number of innocent black people, women and men, who have died at the hands of some of our police officers. This is not an easy or simple problem to solve. We cannot blame the entire problem on our police officers. I taught one summer at an inner city school. The school where I taught was only in a medium-size city. What I saw and the hopeless I saw in the 10 year-old children as assistant in the classroom, was deeply depressing and baffling. These kinds of neighborhoods are all across this country. This level of hopelessness exacerbates healing in these communities. This is a major problem to tackle and REAL CARE, not just window dressing, will “fix” it. I do not have the answers here. What I do know is that we have to work together in a respectful way of all people and face this together because whether we like it or not, we ALL created these neighborhoods with the history of race and racism that this country has had. It is people and children such as these that give me hope about our future. So often in the past and now, we are waiting for our political leaders to tackle what we need to change. We citizens and individuals working together, can be courageous together, just as Stephanie Shirley was and Our Children’s Trust and Black Lives Matter are already changing our world now for the better for each and every one of us. I am a mother of one child. I have cherished my daughter from the day she was born. My mother, I cherish, too. I am one of the acorns of my family tree. I have four other siblings. I have always loved my mom, and at times actions and things that were said to me from the past have stood between us. How did I learn to cherish these loved ones? It has been a process of looking inward. These are all verbs that require me to try to act on behalf of someone I love. To me it requires me to try to love unconditionally, without judgment. I am trying to give those I love free rein without imposing my will, wishes, or any manipulation to get the outcome I want; I am working to accept them for who they are. These “requirements” can be challenging to live in action. Very recently my own will was tested when I spoke to my elderly mother on a visit. The child in me did not accept and felt hurt by an exchange I had with her. Although she is 98, I wanted her to respond differently than how she did. Over the last week, I had to go inward because the adult in me had not allowed myself to feel what I felt about my mother’s response. I had shut down my own feelings. After several days of processing, I became able to accept what she had said because I could NOT expect her to say words that I wanted to hear, but that she was unable to say. With my daughter I feel a deep connection and love her dearly. With my mother I am aware of a difference in my connection with her, and I love her. It has taken me years to understand that my mother is and was truly doing the best she can and could when I was a child, and she grew up in a very different era than I did. My mom made different choices in life than I have. My expectations of how both of them “should” be, don’t matter. Those are mine. I have no control over others. This is where I get to learn that we are separate and have our separate lives and live and walk on separate paths. They are both a wonderful part of my life. However, they are only two of the reasons I am happy to be alive. They are not my sole reason for living. I have my own purpose, my own path, my own reason to be alive. Getting to this point of more ease, peace, and acceptance, has taken a lot of reflection and actual work, and it is ongoing. In the past, I NEEDED to be and was desperate to be a HELPER and FIXER. I thought that was my role in life. I was always watching out for others, and neglecting my OWN needs because I was unaware of what they were. This video is a short version of how to start being compassionate to yourself, and thus, become able to give that to others. Kristin Neff PhD has written and done extensive work and study about self-compassion. Here is a taste of what she is suggesting as a way to look inward. She was one of my teachers who helped me learn who I am, so that I could begin to cherish myself, as well as others. Becoming able to have self-compassion for myself and others, particularly those I love, has resulted in me becoming the “mostly” happy person, I always wanted to be. Most of the time now, I know what I am feeling, so I can sit with both my suffering and joy, and not get stuck long term in the moments of suffering in my life. Being more present for my own life has been awesome and full of wonderful possibilities. I am learning to cherish myself and own life with deep gratitude, and thus, I am able to cherish those I love in deep and wondrous ways.